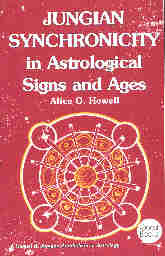 This is not the best book of Alice O. Howell's to begin your reading of her with because her earlier book, Jungian Symbolism in Astrology goes into detail explaining that the "dear friend" introduction to each chapter appears because the author has written the books as letters to a Jungian analyst friend of hers. The author takes us on a tour of the signs and houses in the first half of the book, encouraging us to memorize them as an aid to the rest of the book. In a typical Jungian approach she gives equal attention to the two sides of the signs and the houses - explaining the connection of the dualities. This proves helpful in the second half of the book when we analyze the dualities of Taurus-Scorpio, Aries-Libra, and Pisces-Virgo as they existed over each age's 2000 year period. In the Aries-Libra duality we find the fiery leader Moses (Aries) bringing down the Ten Commandments (Libra) to his people. In the Pisces-Virgo duality we find the "fisher-of-men" (Pisces) born to the immaculate virgin Mary (Virgo). On the predictive side we can expect for the coming age, which we`ve already put our toes into, that the Aquarius-Leo duality will cause much tension between the democratic ideals (Aquarius) and the ruler mentality (Leo). Similarly in the Houses of the horoscope, we find the ego or persona in House One opposite the projections we place on others in House Seven. Ms. Howell knows that to be a Jungian is to understand astrology from the inside out, from the psychical to the physical. She sees astrology as a science that can give us an "X-ray of the psyche" - not so that we can have hard evidence of what will happen in a person's life, but so as to be able to understand what the tendencies will be in a person's reaction to what happens. Since, to have insight to a person's reactions to what confronts them is such a large part of analysis, the science of astrology allows an analyst to "cut to the chase" and provide the avenues for healing that would otherwise have been dead ends.